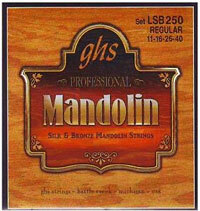 Endorsed by Doyle Lawson the GHS LSB250 Mandolin Strings set consists of 8 Strings and made of Silk & Bronze. I was extremely pleased with the price, ease of ordering, and prompt turn around time!! I’ve recommended to lots of pickers!! Strings arrived within a few days. Q: do these come with a loop or ball end? That set has loop ends.